World Builder: Future of CAD? Bruce Branit put together this great short film, World Builder, in which he visualizes the future of hands-on 3D modeling. World Builder is a futuristic mix between the Holodeck from Star Trek, Maya (or Sketchup, 3DsMax, Rhino, Modo, etc), and SecondLife. The film was produced with one day of live footage shooting and 2 years of post production. We surely won’t be using our own World Builder, as pictured, any day soon… But I do wonder how long it will be before we have visualization systems this powerful and interactive. Just look at the progress in computer based modeling software that we’ve made in the last 25 years. Compare Pixar’s first (pre-rendered) animated short from 1984 to what can be visualized in real time with Luxology’s upcoming Modo 401. If experimental visualization tools like ILoveSketch (you must watch the demo videos) are any indication, we won’t have to wait too long for our own World Builder. Of course progress will be exciting and difficult at the same time. It will be exciting as knowledge of a tool becomes less of a barrier to communicating ideas, but that is exactly what will make the people and industries that have invested so much time and money into learning current tools so defensive. We’ve seen the rise of the user-generated-web shift the production of entertainment from professionals to the masses, and I’d argue that the result has been the discovery of more great ideas and talent that used to be lost due to a lack of resources. Perhaps we’ll see the same shift happen in the design of artifacts. I watched Ratatouille on DVD a couple nights ago, such a great movie. 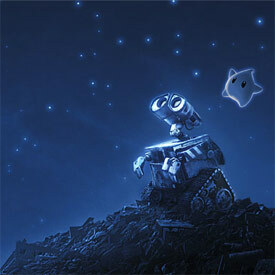 Before the movie started, there was a teaser for a new Pixar movie, Wall-E. The visuals in the very few rendered scenes shown looked amazing. The character design was also spot-on, as usual. I was reminded about Wall-E a few minutes ago, as I read Cabel’s Blog, where he recounts seeing a test screening of the film. … as it was largely unfinished, we only later realized that we were fully engrossed and laughing out loud at what amounted to a series of still napkin sketches for at least half the film â€” that, my friends, is the power of the Pixar story. I’m really looking forward to Wall-E, and continually amazed at Pixar’s ability to ferociously push all of the envelopes of visual presentation, technical accomplishment, and story telling, without ever letting one element overshadow the others. You will gasp in awe.